Hmm… a three-hour boat tour. Why did this sound eerily familiar and where is Gilligan when you need him? 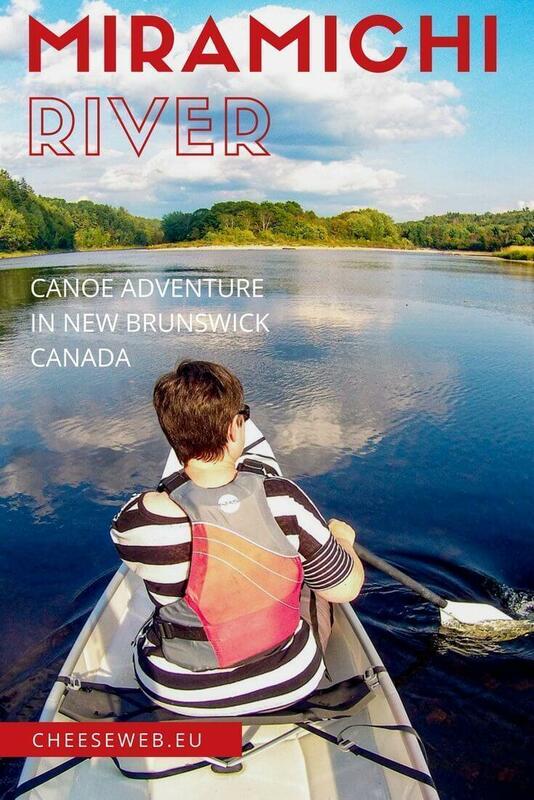 We hadn’t set out to have an epic adventure on the Miramichi River that morning. It was a gorgeous September day; unseasonably warm with the heavy, golden light that graces the Maritime Provinces during our Indian summers. We were heading towards the final stop on a whirlwind media trip to discover more of New Brunswick’s Acadian Coast. After a long spring and summer of slow travelling in our home on wheels, it was strange to be sleeping in a different bed every night. However, we loved experiencing the region’s vastly different accommodations, from charming Bed and Breakfasts to luxury hotels, and hearing their owners’ unique stories. 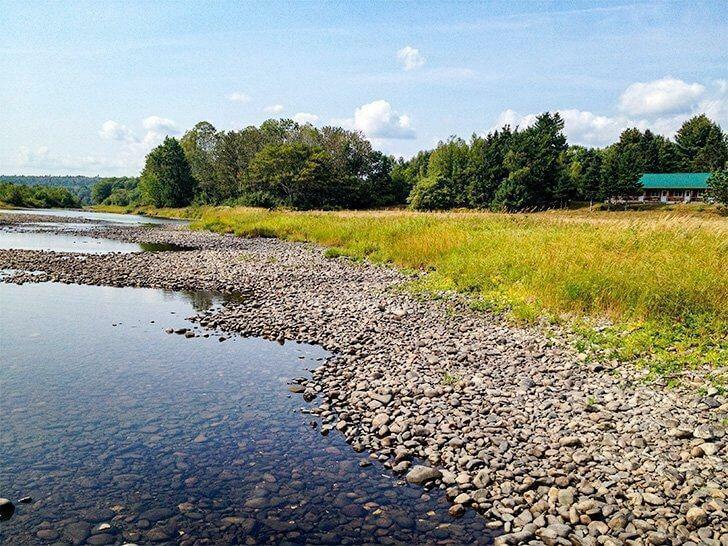 Our final stop was to experience life in the heart of the province on the Miramichi River at Storeytown Cottages. We were looking forward to discovering this secluded retreat, and we were excited to get our origami canoe in the water for a real test – we just had no inkling of what a test it would be. One of the reasons for our visit to Storeytown Cottages was our desire to drive the Miramichi River Route, one of New Brunswick’s five scenic drives (Read more about NB’s scenic drives here). Designated by a purple sign sporting a leaping salmon, the Miramichi River Route runs from the provincial capital city, Fredericton, to Miramichi City on the Acadian Coast. The highlight of the route, of course, is its namesake, the mighty Miramichi River. This meandering river is roughly 250km long and consists of two main branches and numerous tributaries. Throughout history, the river has been pivotal to the region’s two leading industries – logging and fishing. These days, the forestry industry depends less on the Miramichi as it once did but the fishing is still world-renowned, and the salmon is the king of the river. Even if you don’t fish, the Miramichi River is a hive of summer recreation; its waters ranked among the top ten cleanest in the world. 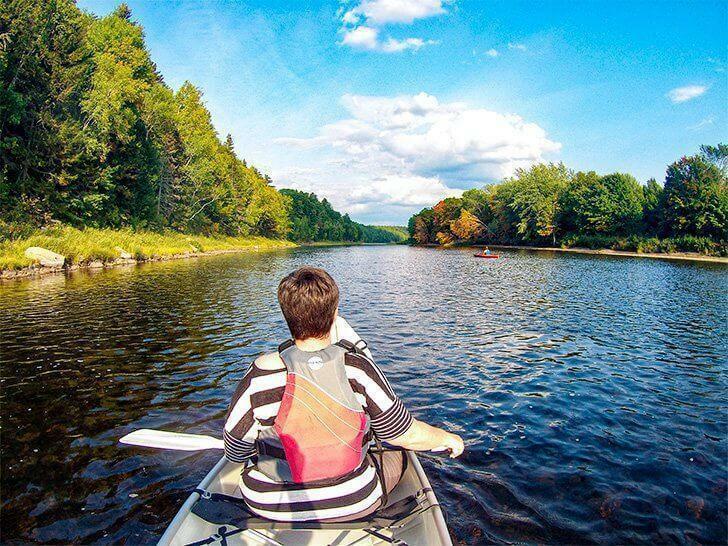 Watersports including swimming, tubing, kayaking, canoeing, and stand-up paddleboarding are all on offer along the Miramichi – and you can sample them all at Storeytown Cottages. 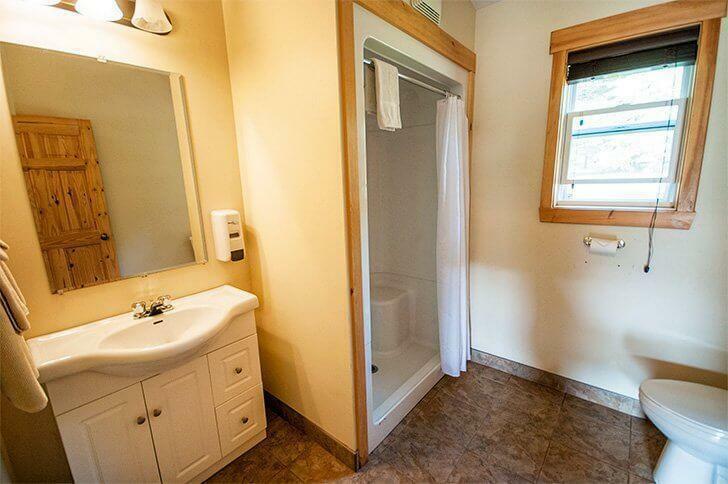 Storeytown Cottages are located almost smack dab in the middle of the Miramichi Route on the outskirts of the village of Doaktown. Doaktown, named for one of its prominent citizens, Robert Doak, began its history as a logging settlement and was later inhabited by Loyalists. These days the village is a hub for salmon fishing and is home to the Atlantic Salmon Museum. One of the things we’ve enjoyed most about being back in Canada is the ease at which we can surround ourselves with nature. 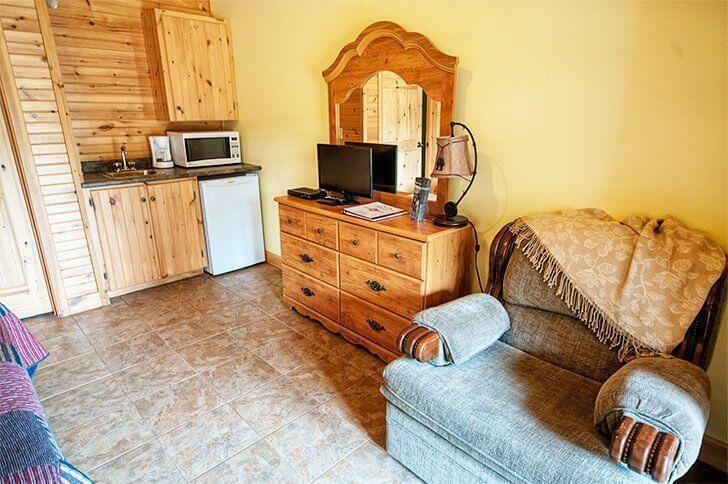 While Storeytown Cottages is only a two-hour drive from the major cities of Saint John and Moncton, New Brunswick, it feels an absolute world away. Storeytown began its life as O’Donnell’s Cottages, with one cottage on 17 acres, back in 1991. In 2014, after expanding the business to what it is today, the O’Donnells sold it to the current owners who greeted us warmly when we arrived at Storeytown. Jeremie and Christine are a young and energetic couple who left Ontario together in search of ‘Maritime hospitality,’ with a dream of owning their own business. Along with their adorable dog Scotch, they took on the challenge of Storeytown and made it their own. These days, the property consists of 4 cottages in a range of sizes, a multi-unit lodge with kitchenette suites, and the reception building with a dining area and small shop. The lodge and cabins sit on a hillside overlooking the river. Our room, in the lodge, was spacious and comfortable, with a large bathroom, comfortable bed, and everything we needed in our little kitchenette area. While we were only staying for one night, we could easily spend a long weekend here, relaxing on the covered porch. 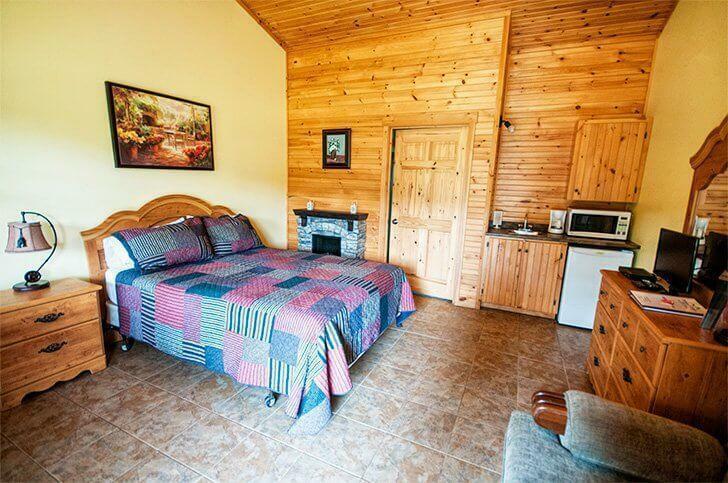 For an extended stay, we would opt for one of the cosy, fully equipped cabins. As certified kayak, canoe, and stand-up board instructors Jeremie and Christine offer just about any water-based activity you can think of at Storeytown Cottages as well as providing packages for golf-lovers, romantic couples’ retreats, and winter fun. 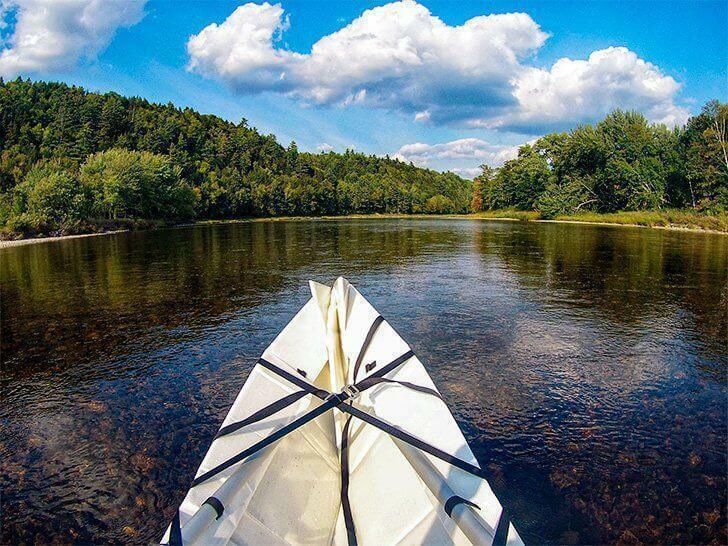 But we had arrived with our portable canoe and were eager to give it a try on the tranquil (we thought) Miramichi River. Before we could hit the water, we had one more appointment. As the final stop on our New Brunswick tour, we had agreed to meet our new contact at NB Tourism at Storeytown as well. When Anna-Lee arrived, we hit it off right away. 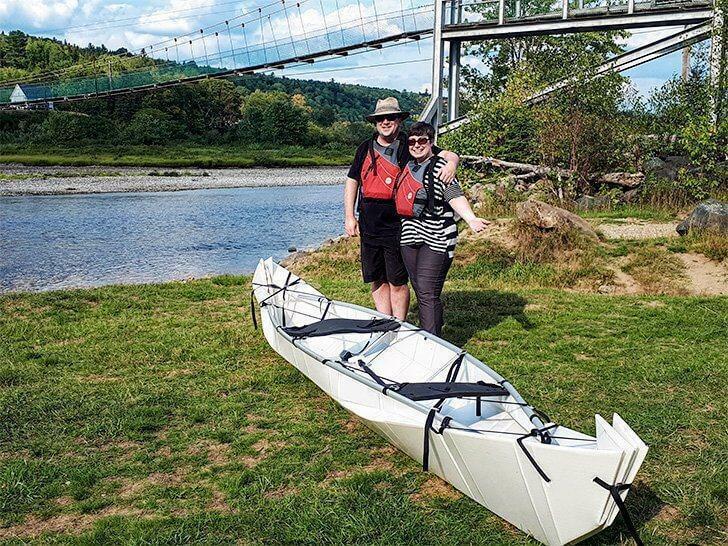 As an accomplished kayaker herself, it didn’t take much arm-twisting to convince her to join us for an outing on the river – all in the name of research of course. We were deposited at the base of the McNamee/Priceville Footbridge, the longest suspension footbridge in New Brunswick at 200m. As always, while we assembled our folding canoe, we drew a small crowd of curious onlookers. By now we had half a dozen attempts at constructing our Onak, and it didn’t take us nearly as much time to get our canoe in the water. It wasn’t long before we were floating lazily under an almost cloudless sky. While we paddled, we chatted with Anna-Lee about our adventures in New Brunswick, her new job with NB Tourism, and most of all, how lucky we were our jobs permitted us to be out on the water on such a stunning autumn day. Spending most of our days hunched over our respective computers paid off in dividends like this perfect afternoon. As we half-paddled half-floated down the river, I began to notice the water becoming shallower. In my forward position as ‘rock scout,’ it was my job to keep an eye out for obstacles. The problem was, the entire river was becoming an obstacle. With its flat bottom, our Onak rides relatively shallow in the water, but our back end was beginning to scrape bottom. Andrew decided to hop out and pull me along until we hit deeper water. Anna-Lee waited for us up ahead in her kayak. We continued to navigate shallower and shallower water. 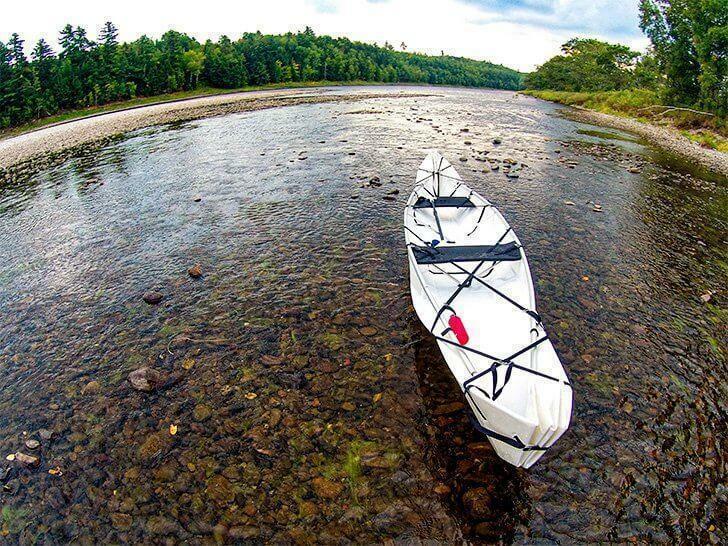 The unseasonably warm temperatures had dried up the Miramichi more than usual until even Anna-Lee had to bail out of her kayak. Navigating the rocky river bottom on foot was no easy task. We did, however, briefly pick up a hitch-hiker. Anna-lee almost stepped on a small turtle who blended almost seamlessly with the surrounding rocks. 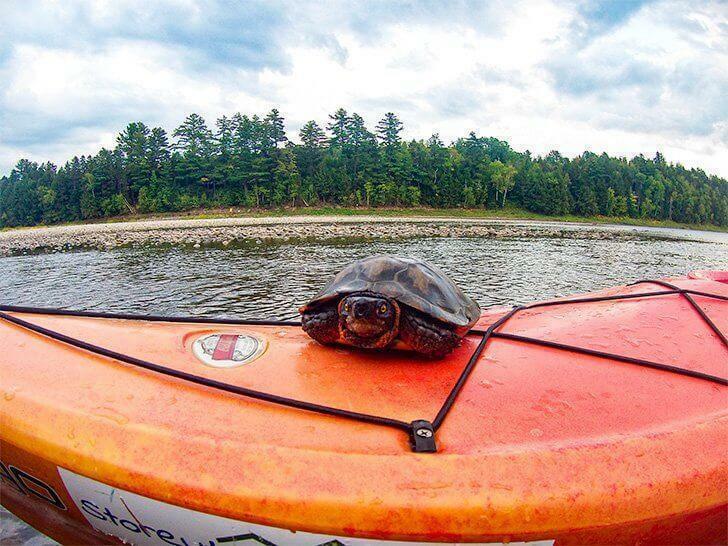 Meeting friends on the Miramichi River like this small turtle. We continued down the river, at times walking more than we were paddling. We were concerned the constant scrapping was going to tear the bottom of our lightweight canoe to shreds. This concern turned out to be the least of our worries. We had just pulled up alongside Anna-Lee who had been waiting for us just beyond a small set of rapids we managed to navigate easily. As we paused, the wind came up, and our bright blue sky suddenly darkened. They say if you don’t like the weather in the Maritimes to wait five minutes, but this was unlike anything we had ever seen. Looking at the GPS on her phone, Anna-Lee informed us we still had quite a way to go to get back to Storeytown. Our lazy float down the river had become an all-hands-on-deck paddle against the wind. Muscles we didn’t know we had were screaming as we alternated between paddling and walking the shallow water. As we approached each new island, we hoped this was the one that faced Storeytown. What felt like an eternity later, we saw the cabins ahead, and Jeremie and Scotch waited on the riverbank to help haul us ashore. Our journey had taken twice the amount of time it should have. Anna-Lee was late for another engagement, and we felt ready to collapse. All we could do was laugh – mere hours ago we had been marvelling at our luck with the weather. Mother Nature had undoubtedly shown us why we shouldn’t take her graces for granted. We bid farewell to Anna-Lee and quickly changed out of our wet clothes. Luckily, Christine had prepared a feast for us, and her hearty stew and fresh-baked bread was just the thing to restore our calorie levels. After supper, we sunk into the hot tub to ease our screaming muscles. Despite the unexpected weather and workout, it had been a fantastic day on the Miramichi. We were also thrilled to see our Onak folding canoe had survived the trip almost entirely unscathed. 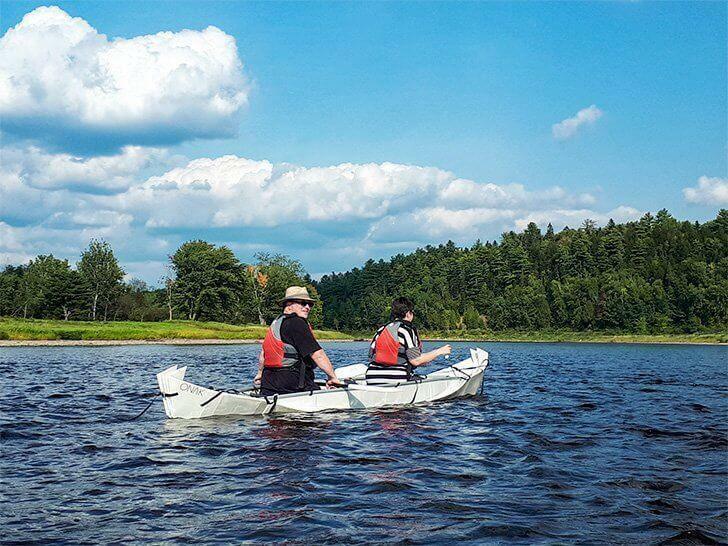 While we’re both eager to experience the Miramichi River again (I’d love to try tubing and paddleboarding), we’re going to opt for a bit more water next time! 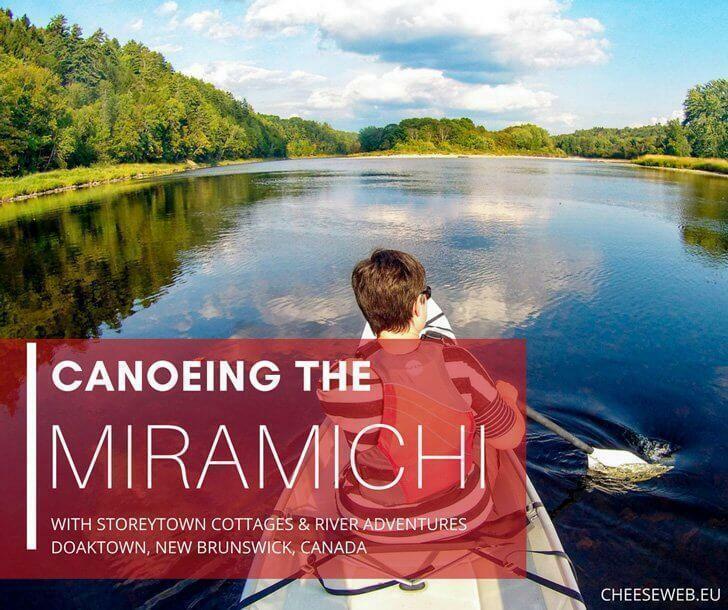 We were thankful we had the opportunity to discover this hidden gem in the centre of New Brunswick, and we hope to return for a longer stay to experience more of what the Miramichi River and Storeytown Cottages have to offer. We’d like to thank Christine, Jeremie, and Scotch for hosting us at Storeytown Cottages, and Anna-Lee of NB Tourism for joining us on our river adventure. We’d also like to extend our thanks to New Brunswick Tourism for hosting our stay on New Brunswick’s Acadian Coast. As always, all opinions remain ours alone.